Easy to grow and delightfully fragrant, Peonies are the classics all gardeners desire. Thriving in full sun to light shade, huge double blooms sit atop sturdy erect stems. 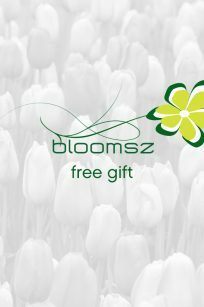 In Bloomsz Breeder’s Choice Cut Flower Peony Blend, you’ll find blooms that have: bright yellow accents in a center of creamy white, a touch of yellow at the base of milky white, deep coral buds that open to coral-peach, strikingly beautiful apple blossom pink coloration, and deep pink that grows lighter at the edges. Select an area in the garden that receives full sun where the soil drains well. Loosen the soil to a depth of 12”-18” and amend with compost if necessary. Place the fleshy roots into the soil so that the “eyes” or growing points are no more than 1”-2” below the soil level. Plants should be spaced 24”-36” apart. Tamp down the soil and water well. As the plant begins to grow, place a hoop-type stake into the ground to support the plant and its heavy blooms. Water deeply during periods of drought. A classic peony. 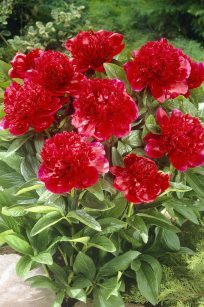 Double Red Peony blooms early season with huge deep red flowers that are showstoppers in a garden or arrangement. Massive 8 inch double blooms- one of the biggest peony flowers with a sweet citrus fragrance. 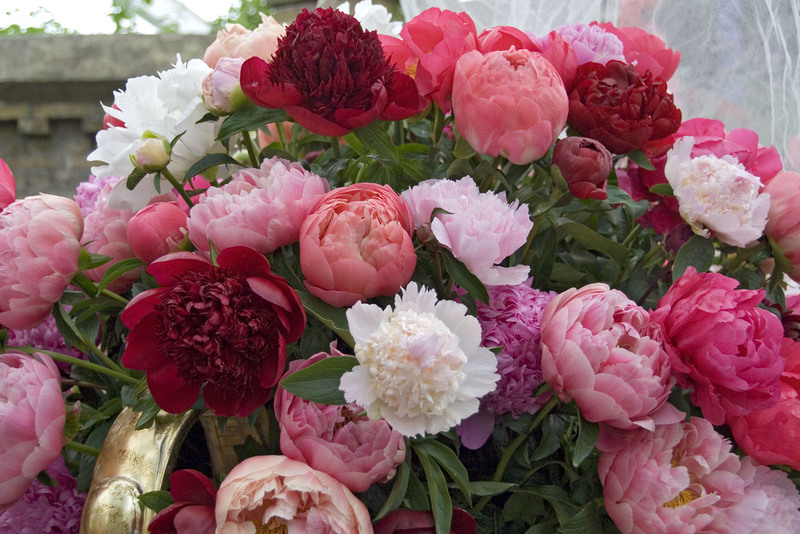 Easy to grow and delightfully fragrant, Peonies are the classics all gardeners desire. 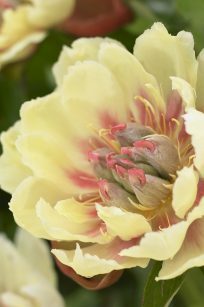 Vigorous and floriferous, Bloomsz Border Charm Peony is an excellent choice for low borders, beds, and smaller gardens. Large, exotic light yellow flowers tinged with red flares in the center bloom on sturdy stems. The glossy deep green foliage remains attractive throughout the summer and into fall. These charmers will bring compliments galore and attract butterflies, too! 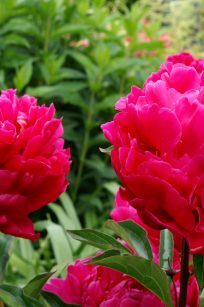 Easy to grow and delightfully fragrant, Peonies are the classics all gardeners desire. Thriving in full sun to light shade, huge double blooms sit atop sturdy erect stems. Showy deep red petals are ruffled along the edges, and foliage remains attractive throughout the summer and into fall. Use in borders or along fences, sidewalks, driveways, and walls; these charmers will bring compliments galore and attract butterflies, too! 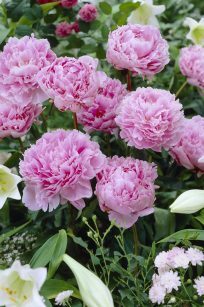 A classic favorite, the Sarah Bernhardt peony is a strong grower and a prolific, reliable bloomer. Extremely large double blooms grow on stout, strong stems that don’t require staking. The large, bow-shaped double flowers, darker pink at the center and lighter toward the edges, have a memorable fragrance. This excellent cut flower will last a full week if cut when in full bud.